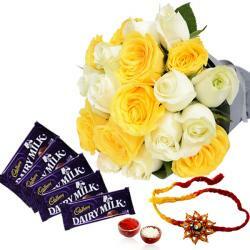 Bouquet of 15 stem of seasonal flowers in tissue paper, Cadbury Celebration Chocolate Pack (Weight : 140 Gms) along with one Rakhi, Roli Chawal. 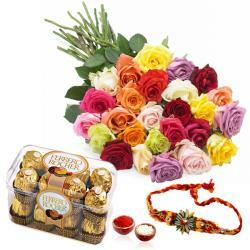 Your brother will find this Rakhi gift pack really endearing indeed. 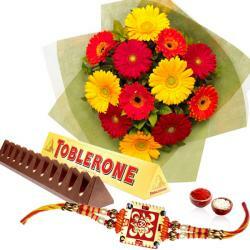 Pack containing a lovely Rakhi which showcases an amazing design and will look fabulous on your brother wrist for sure. This is accompanied by Roli Chawal which is a traditional prerequisite for sisters and Lovely Flowers and Cadbury Chocolates which is a lip smacking round-off to the festive celebrations. 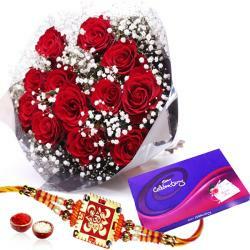 This gift pack will definitely be a wonderful way to express your love and affection for your darling brother on Raksha Bandhan. 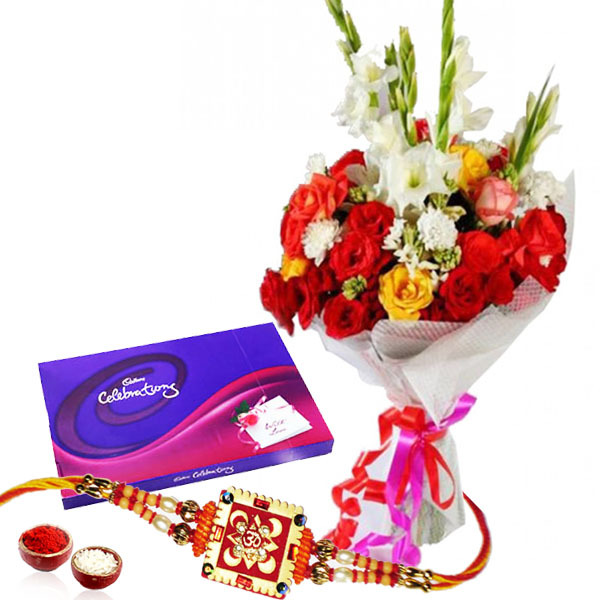 Beautiful Rakhi Combo includes: Bouquet of 15 stems of seasonal flowers in tissue paper, Cadbury Celebration Chocolate Pack (Weight: 140 Gms) along with one Rakhi, Roli Chawal.